OCEANIA spans opposite sides of the Pacific Ocean in search of what ties our seemingly fragmented histories, disparate experiences and future fates together. 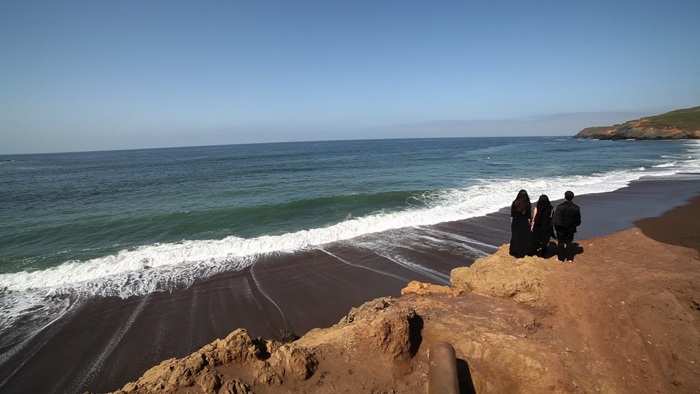 Throughout this feature-length film, the viewer is taken on an exploration that begins on the North Pacific Coast–at the site of a former military bunker and geological fault line (the filmmakers’ current base)–to the Earth’s center, where the Equator and International Dateline intersect. In this part of the South Pacific, we visit a group of coral atolls known as the Republic of Kiribati. Climate scientists predict that these low-lying islands will be uninhabitable by 2030, due to rising sea levels caused by climate change. Here we are introduced to a traditional village and our main character, Tekinati—a mother of four whose ancestry on these islands dates back over 3000 years. As we return to the North, we reflect on our techno-industrial perspective and the “ecological rift” that characterizes our own cultural context. This rift is mirrored in the geological landscape. Here is a place where the North American Continental Shelf plunges in depth and darkness; where radioactive waste was dumped for over 30 years, forever submerged on the sea floor. The Ritual of Recovery takes place on this edge, where we attempt to reawaken our connection to that which sustains us.